Morning Musume glass & coaster set. New, never opened. A great addition to your Jpop collection! This auction item available only in United States and Canada. Morning Musume, C~ute and Berryz Koubou each released glass and coaster sets in the Winter of 2007 and these were produced in limited quantities. The glass is really pretty and measures a tall 7 1/8 “s making it perfect to enjoy your favorite juice, beer or even wine although it’s not really a wine glass…something I’ve proved a few times to not matter one bit :P! But no matter how you decide to enjoy this high quality glass collectible from Morning Musume you can also rest assured that no bit of condensation or drips will affect any of your household surfaces as it also includes a stylish and thick rubberized coaster which also bears the Hello! Project and Morning Musume logos~. 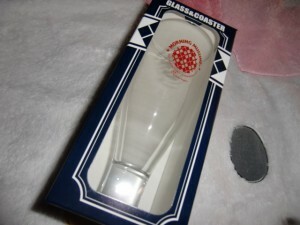 This glass and coaster set is 100% new and never opened! You so know you want to drink out of it asap!